Seahawks defensive end Michael Bennett is known for his openness and willingness to tackle tough issues. That is why it comes as no surprise to see him publicly criticize the Las Vegas Metropolitan Police Department on social media for what he says was racial profiling during the Floyd Mayweather Jr. and Conor McGregor fight weekend. He claims that on Aug. 26 he was headed back to his hotel after the Mayweather-McGregor fight at T-Mobile Arena in Las Vegas when several hundred people heard what sounded like gunshots. Bennett says that when he began to run like many others did around him, police officers singled him out and pointed their guns at him for "being a black man in the wrong place at the wrong time." The police ordered him to get to the ground and according to his letter they told him they were going to "blow his f***ing head off." He recounts an officer placing a knee in his back, restricting his breathing, and handcuffing him so tight that his fingers went numb. Bennett says that is when his life flashed before his eyes and he thought he'd die on the floor for no reason other than being black. After being handcuffed, Bennett was taken to a nearby cop car until police could identify him. At that point, they realized he was no threat and let him go. For Bennett, the feeling of relief was not enough to overcome the horrendous circumstances surrounding his detainment. 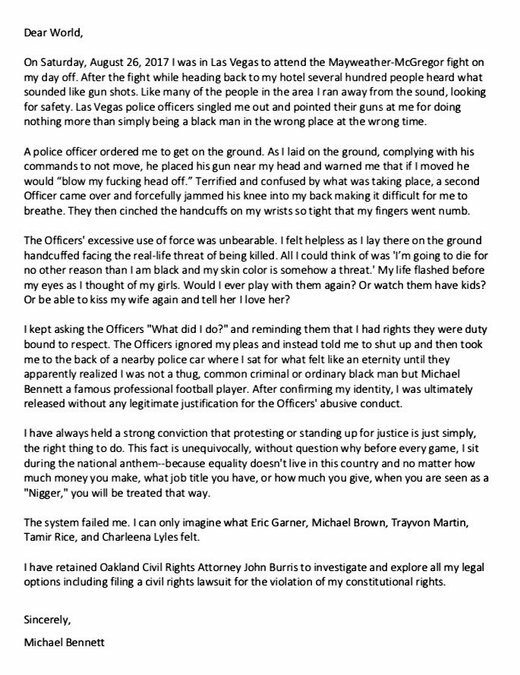 He expresses later in his letter that these situations are exactly why he no longer stands for the national anthem before games and why he is so outspoken on racial inequality. It is unclear whether Bennett will pursue legal action against the LVMPD but the release of video footage from that night, which can be seen below, will surely send the sports media world into a frenzy and place Las Vegas officers under a microscope. A former Las Vegas police officer is currently facing charges for the death of a black man named Tashii Farmer on the Las Vegas Strip. Kenneth Lopera put Farmer in a chokehold after a confrontation outside The Venetian hotel-casino. He has been charged with involuntary manslaughter and oppression under the color of office. Farmer's family has filed a wrongful death lawsuit against Lopera and the Las Vegas Metropolitan Police Department. A recent documentary titled "What Happened in Vegas: The movie police couldn't erase" has also been making the rounds on social media. The documentary was made after the filmmaker witnessed Las Vegas police allegedly abusing a stranger in custody. After the filmmaker called 911 to report police brutality, he was reportedly attacked by police. The documentary investigates what is described as a terrifying pattern of police brutality in the Las Vegas police department.